Nicknamed Giant Killer for her many wonderful feats, Garbine Muguruza is currently ranked #19 in the singles and #12 in doubles category by Women’s Tennis Association. She was born to a Spanish father and Venezuelan mother in 1993. Having started to play tennis at the age of three after moving to Spain, Muguruza joined Bruguera Tennis Academy to pursue her career in tennis. Muguruza’s family takes Tenis quite seriously. She always maintains that her elder brothers were her motivation and that she would not have been a player if not for their love of the game. They all went to the Tenis Academy but were not able to make a career out of it. Garbine first started her career as a wildcard entry at the 2012 Miami Open where she won over former #2 Vera Zvonareva and #10 Flavia Pennetta to make her name in women’s tennis. She then played at the 2013 Indian Wells Masters and again took part in the Miami Open. Best known for her aggressive gameplay, Muguruza made her breakthrough in 2014 through Auckland Open where he reached quarterfinals and lost out to Venus Williams. She qualified and won her first WTA singles title at the Hobart International, a week after. She also played at the Australian Open and faced a fourth-round defeat, despite making huge improvements in her gameplay. With her participation in several Grand Slam competitions, Muguruza became a known face in tennis. Despite losing out and not reaching the later stages of French Open, US Open, and Australian Open, she defeated several top-seeded players in the game. She was placed at No. #21 in the WTA ranking in 2014. Garbine Muguruza started 2015 with high hopes. She reached her second grand slam quarterfinals at the French Open and also gave a tough fight against Serena Williams at the Wimbledon finals in 2015, to reach her first career grand slam final. Garbine Muguruza’s Wimbledon 2017 run was overshadowed by allegations that she received coaching from outside while the match was on. The in-match coaching claims became louder in her match against Svetlana Kuznetsova, which she won (6-3, 6-4) to secure a place in the Wimbledon 2017 semi-finals. Kuznetsova’s coach tried to bring the alleged coaching to the notice of the line umpire to no avail. Today, she is the winner of four singles titles, including the 2016 French Open where she defeated Serena Williams and the 2017 Wimbledon Championships where she triumphed over Venus Williams. 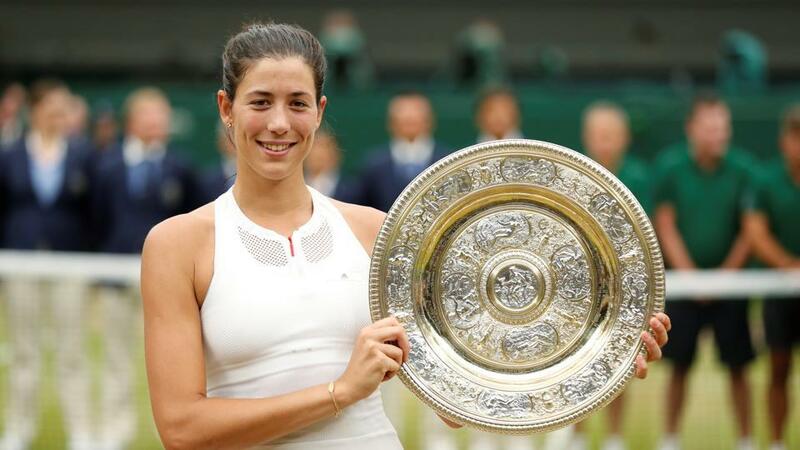 Muguruza became the first player to defeat both of the Willimas sisters after she won the Wimbledon championship in 2017. In 2015, it was reported that Muguruza has won over $2.5 million in career prize money, to be one of the highest earning women tennis players at such age. In 2017, she became the highest-earning female tennis star after defeating Venus. Muguruza has now received $3.9m (£3m) from her achievements on the court for the said year. This is $1m larger than world No2 Simona Halep who is the second-biggest earner at $2.9m. Most of Muguruza’s endorsement deals started coming in 2014 when she came to limelight. She became the brand ambassador for Mazda and BBVA bank in December 2014. For Product endorsements, Muguruza has partnered with Rolex, Adidas, Babolat, and Maui Jim. Her partnership with Rolex seemed only natural since she has a love for the brand long before she came to the limelight. Muguruza revealed that the first time she won and wanted to reward herself, she already knew what Rolex watch she wanted to get. Said to have similar playing attributes as Maria Sharapova, Muguruza is a baseliner and her flat-hitting power is what puts her in the game. With her career still to find its peak, Garbine Muguruza’s assets stand at $12 million today. After winning her first Wimbledon women’s singles crown, the tennis star made public her intention to become an Ambassador for the international education NGO Room to Read. Part of her contribution will be to help the organization grow its impact in two focus areas of early grade literacy and equal access to secondary education for girls. For now, it seems to be all work, vacation and no romance for the tennis star. Muruguza is believed to be single. So far, there’s neither been suspicious friendships nor any record of a romantic relationship with anyone.